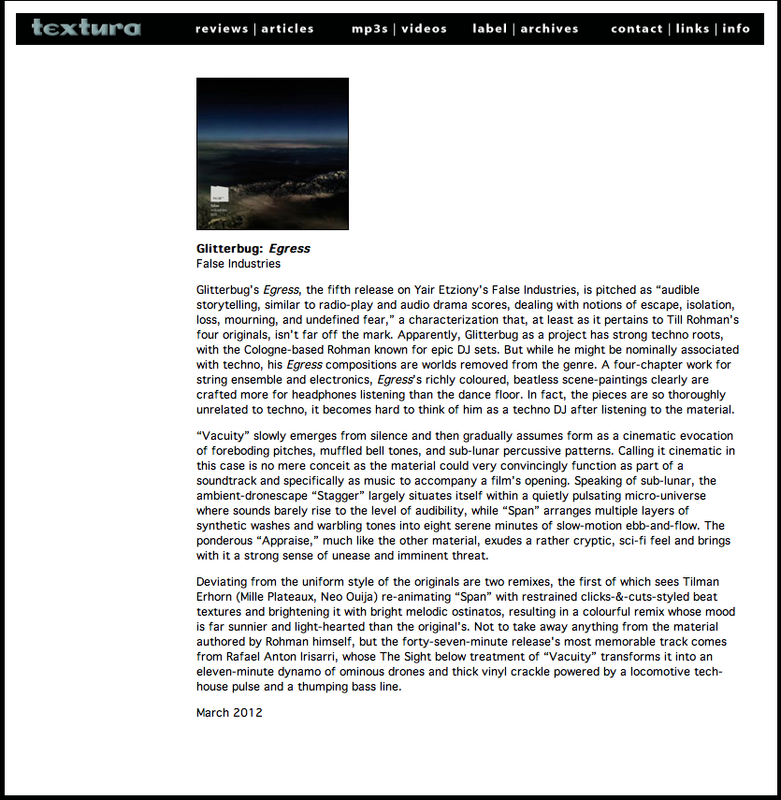 You can also read the review on Textura’s website. Glitterbug’s Egress, the fifth release on Yair Etziony’s False Industries, is pitched as “audible storytelling, similar to radio-play and audio drama scores, dealing with notions of escape, isolation, loss, mourning, and undefined fear,” a characterization that, at least as it pertains to Till Rohman’s four originals, isn’t far off the mark. Apparently, Glitterbug as a project has strong techno roots, with the Cologne-based Rohman known for epic DJ sets. But while he might be nominally associated with techno, his Egress compositions are worlds removed from the genre. A four-chapter work for string ensemble and electronics, Egress’s richly coloured, beatless scene-paintings clearly are crafted more for headphones listening than the dance floor. In fact, the pieces are so thoroughly unrelated to techno, it becomes hard to think of him as a techno DJ after listening to the material. “Vacuity” slowly emerges from silence and then gradually assumes form as a cinematic evocation of foreboding pitches, muffled bell tones, and sub-lunar percussive patterns. Calling it cinematic in this case is no mere conceit as the material could very convincingly function as part of a soundtrack and specifically as music to accompany a film’s opening. Speaking of sub-lunar, the ambient-dronescape “Stagger” largely situates itself within a quietly pulsating micro-universe where sounds barely rise to the level of audibility, while “Span” arranges multiple layers of synthetic washes and warbling tones into eight serene minutes of slow-motion ebb-and-flow. The ponderous “Appraise,” much like the other material, exudes a rather cryptic, sci-fi feel and brings with it a strong sense of unease and imminent threat. Deviating from the uniform style of the originals are two remixes, the first of which sees Tilman Erhorn (Mille Plateaux, Neo Ouija) re-animating “Span” with restrained clicks-&-cuts-styled beat textures and brightening it with bright melodic ostinatos, resulting in a colourful remix whose mood is far sunnier and light-hearted than the original’s. Not to take away anything from the material authored by Rohman himself, but the forty-seven-minute release’s most memorable track comes from Rafael Anton Irisarri, whose The Sight below treatment of “Vacuity” transforms it into an eleven-minute dynamo of ominous drones and thick vinyl crackle powered by a locomotive tech-house pulse and a thumping bass line. 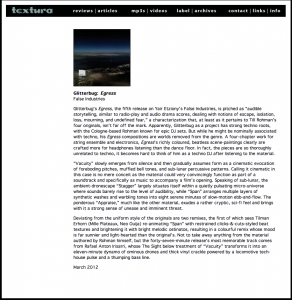 This entry was posted on Thursday, February 16th, 2012 at 11:01 am and is filed under Press / Reviews. You can follow any responses to this entry through the RSS 2.0 feed. Responses are currently closed, but you can trackback from your own site. Ma Iti? – an installation project.